I was suprised (and a little disappointed) when Dr Robert (Masochistic race organiser) asked the starting field how many had done this race before and only 3 people raised their hands. I did this 2 years ago and it had remained my favourite race in the UK. I aslo recall it being quite hard. Not that this should bother me, I've done some big runs in the two years since I did this, surely it would seem much easier this time? This year nearly 150 people were at the start line, comared to only 50 the time before and 14 the time before that. It only happened once every 2 years which is a shame, I suspect it's to give those who do it more time to forget how hard it was before deciding to do it again. The race description would go something like this; Very steep hill, less steep hill, down loads of stairs, round some woods, UP the stairs, nice downhill section, up another sharp hill, downhill into a cow field then back uphill out of it, downhill in the woods cross a road then tackel the Eiger Steps (lots of really big steps), across a field then over a fence, very sharp uphill then a downhill so steep you have to hang onto trees to stop yourself flying into the road. At the bottom of that hill is a table with lots of goodies on, well deserved and much needed as you then have to turn around and do the whole thing in reverse. The downs become ups and the ups become downs and what happened to flats is irrelevent because there are none of that. So that's back down the Eiger steps, over the hills back to the first staircase then down and up again. 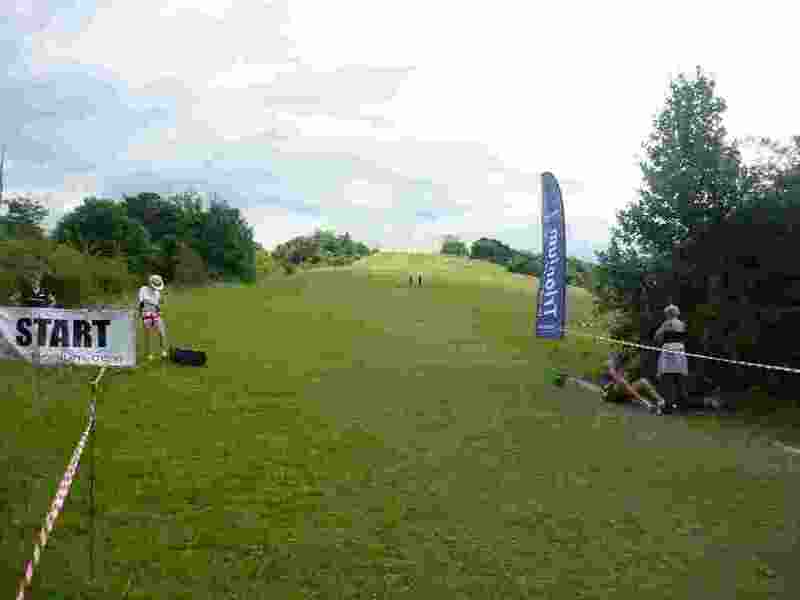 Down the really steep grass hill you remember at the start and then through the finish line. 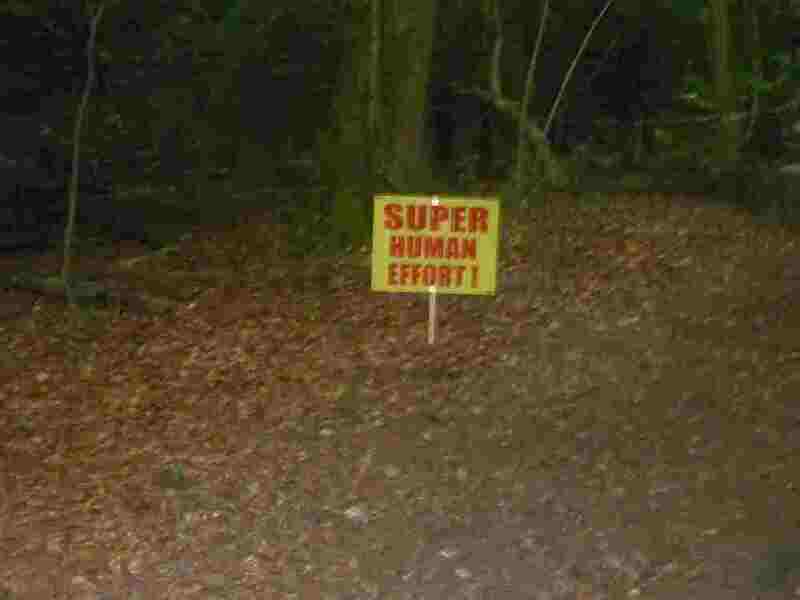 Except that this is the finish line for those doing the half marathon. Sure enough you have to turn around and do all that again. But it's OK, at the end there are carrots. The race briefing reminded us that this was an "astonishingly difficult race", it was almost as if he wanted some of us to give up before the start. We then all sung the national anthem. Well, I na na naaaed most of it as I didn't know the words, the Daily Mail will be fuming. 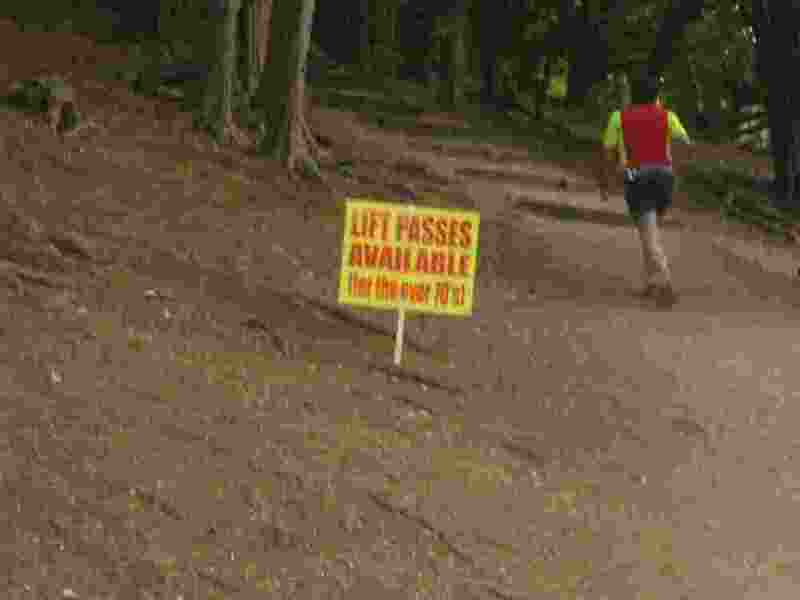 Most people run up the big grassy hill the first time. I ran ahead to take a photo and let everyone else go about their business of racing while I plodded along taking photos and chatting. The steps come after about a mile and are hard work going down. Around a woodland and over a stream via some stepping stones and you are back by those steps and have to go up. I am unaware of any "way to do" steps. It's not normally needed in any race but in this one there are probably about 1000 of them. Are you supposed to hold on to your knees and wade up? Or do you work your arms at the side. I tried everything and nothing worked. It always hurt. And here I was again, 2 years on at the same point, 1.5 miles into a marathon and unable to breathe. I thought of all the pointless times to wear a heart rate monitor, this was it. So I decided to wear it, just to see how funny the lines would go on the graph. I'm sure someone could look at the output and tell me that my work rate was often inconsistent with the power needed to climb the elevation and as a result I was spending too long in the anerobic zone which would results in premature depletion of glycogen and build up of lactic acid. I would call such a person a boring c**t. All I wanted out of it was a funny graph. Somehow I (and about 10 others) managed to miss a turning (it wasn't marked very well). We ran down a nice path at great pace. 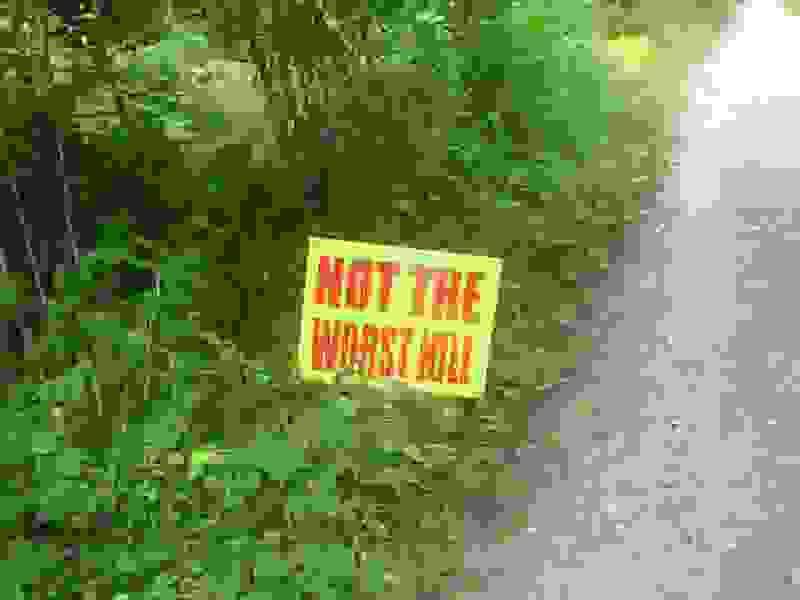 In races like this always be suspicious of long downhills, either you've gone wrong or you are about to emerge from the woods to see a mountain. This time it was the former, we all ran back up the hill and met the rest of the runners going the right way. At this point I was almost last. One of the many great things about this race is that it loops back onto itself a few times and you get to see everyone, the leaders and the ones at the back. I was suprised to see Mark and Rob 2 miles ahead of me after only 5 miles. How wrong had I gone? I later found out that many had took a shortcut as a result of it not being marked very well, I took the short cut too but came back and ran more. I reached the first switchback after about 1.10. Not too bad and was convincing myself that I'd dont the harder part of the course since I had gone up 2 staircases and down 1. I only had to go down 5 and up 4 from here. Heading back I started chatting to a guy who was complaining about the extra distance he did. I said I was happy with it since we'd paid a lot to run this race and the extra miles were free. He laughed and carried on. The Mid Summer Munroe race starts at 4pm, 2 hours after this and is only half of the race the picnicers have to do. On my 3rd staircase I encountered lots of these runners, all looking fresh and not really knowing what was ahead of them. I crawled back up those stairs again and then ran down the big grassy hill to the halfway point. Dr Robert warned us all to save something for the second lap. I suspect everyone gets a significant negative split in this (mine was 2.30/2.46) however I think most people do worse than that. I overtook quite a lot of people the second time round, many of whom had stopped to lay on the floor and deal with cramp, or had just given up altogether. There is a debate to be had here as to whether it is better to know what is coming or whether it is better not to know. I'm not too bothered, my memory is too poor anyway to really notice what happened a few hours before. The stairs do get much harder though. It was all over in 5.16. I didn't break 5 hours again and I was much slower than last time, it was however the first long run I'd done for a while without the return of my chaffing issues so I was really pleased with that. I am going to suggest that Dr Rob makes this into an Ultra next time, that would leave most people crippled. I remember now why this was called "The Hardest Marathon In Britain", the reason being that it is. I thought Exmoor or the Jurassic Coastal marathons might top it but they did not come close. My Garmin said that this was over 10000ft od ascent. Not for the feint hearted, or even most of the normal hearted either.